The recent sweeping changes to retirement plans under EGTRRA (2001) have a major impact on retirement plan participants. Plan sponsors have an obligation to communicate to participants how they will be affected when any change to a retirement plan occurs. Communicating such change is not always easy and presents challenges to sponsors. 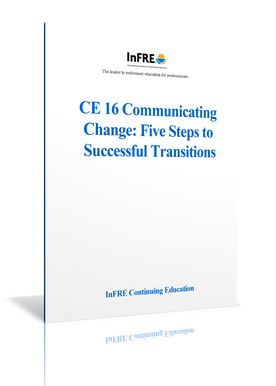 This course presents a 5-step process to follow to be sure the communication/education program is effective and successful. It looks at the issues that change presents, such as resistance to change and rumors. It covers areas such as the importance of establishing trust among the participants; developing the communication campaign using research and planning; understanding the target audience; and training and equipping the personnel who deal directly with participants. Anyone who designs, delivers, or has ultimate responsibility for communications campaigns will benefit from this course.